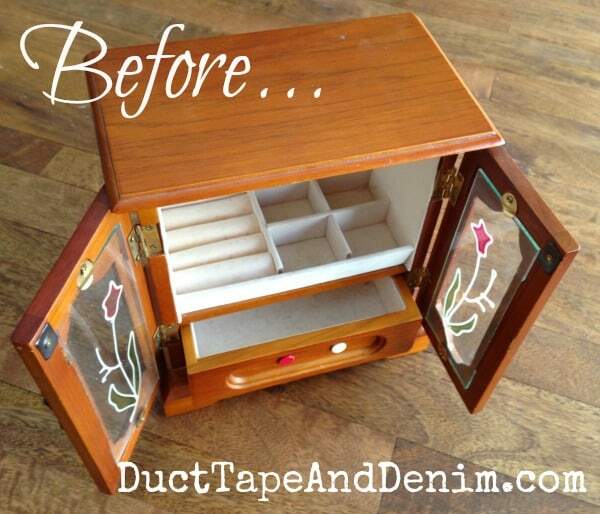 Vintage Jewelry Cabinet Makeover, from Broken to Useful Again! This is a vintage jewelry cabinet that I bought at Goodwill. Isn’t it “beautiful”? Well, I’m sure someone once thought it was beautiful. And it will be beautiful again! This vintage jewelry cabinet had a few little issues with it’s handles. One of the door handles was broken and the handle on the inside drawer was gone. Someone had replaced it with some tacks. Not exactly what I would have used! 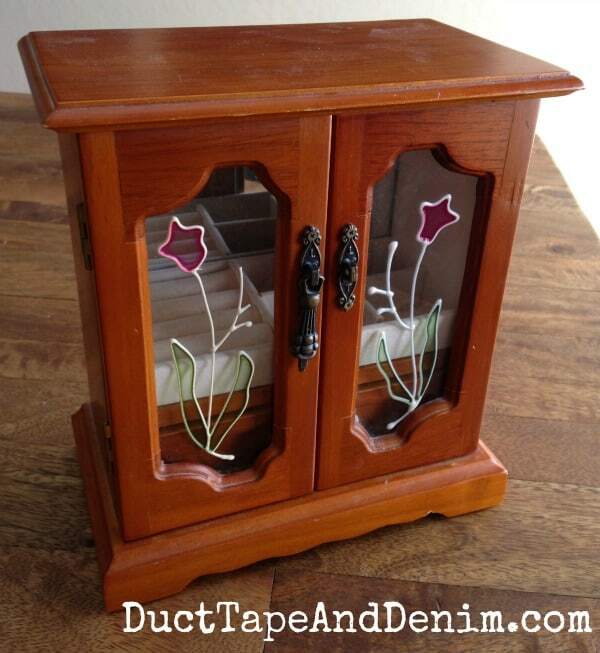 Other than that it was solid and clean… a great candidate for a vintage jewelry cabinet makeover! Here’s what it looked like after it’s makeover! , brushed it on, and quickly wiped that off with another soft cloth. You can see in the next photo that it left a little in the crevices for a more used look. Then I pulled out my jewelry supplies to fix the handle. First I cut off the good handle so the sides would match. Then I picked some charms I liked and added them with some jump rings. , stuck it back in the door, and replaced the metal pieces that were holding the original glass in. 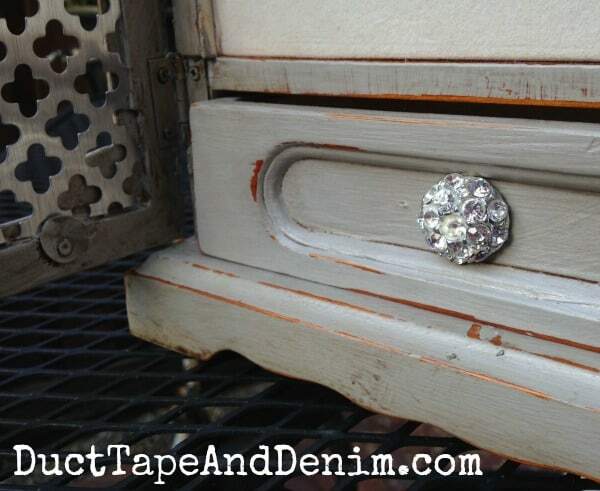 to glue on a vintage rhinestone button. This one went fast! It already sold at the last Paris Flea Market sale and is now back in use organizing our customer’s jewelry! Originally published May 2, 2015. I share at these blog parties. Jewelry boxes are some of my favourite pieces to work on. Every year I sell tons of them before Christmas. It allows me to be really creative on a small piece. My feelings exactly. I like trying out new ideas or techniques on a small piece. I love the makeover Ann! What an improvement to get rid of that glass! 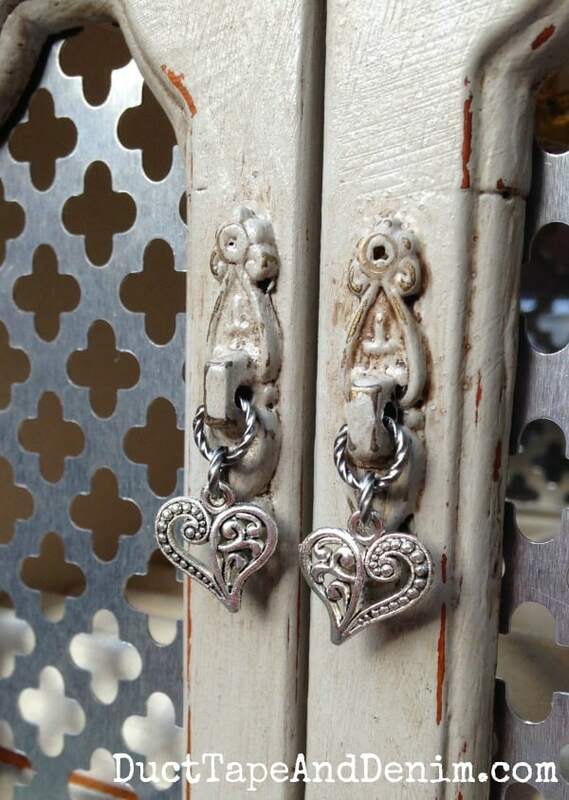 Do you buy jewelry cabinets if they are missing drawers, or do you pass on those? I haven’t yet but I have one in my stash to work on. You’ll see it someday! 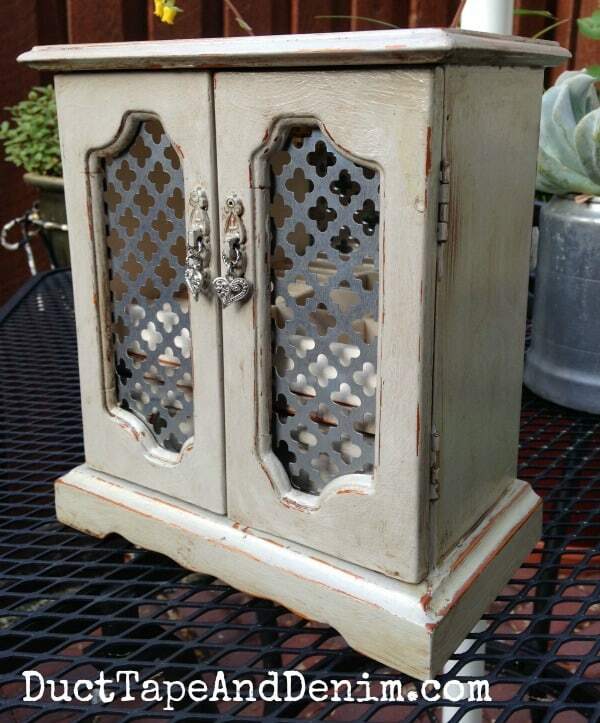 Why does everyone follow “the trend?” I think that jewelry box would look much better with a smooth coat of white paint instead of the distressed look. It’s okay to have something new and pretty – it doesn’t have to look old. I do like the “screen” you put on the glass instead of the flowers. Also, since I sell these I make a variety and tend to make more the same style as the ones that sell. And distressed sells where I am. I do appreciate your comment. Thanks! Where do you buy the metal screen? You know, when I looked at this before, I totally missed that you added those little charms to the door handles! What a great idea I never thought of, and a super way to fix the missing handle problem. Also like the rhinestone button much better than the tacks, LOL! I can see why it sold right away! print material . What are your ideas on this ? Love what you do with the boxes . I’ve used felt, burlap, tissue paper, and paint. Felt is my favorite. It comes in so many colors, too, that you can so something fun. I don’t know if I would be the best one to answer this… I sell mine for $25-45, depending on a lot of different things – Size, finish, where I’m selling it, etc. I see them for $75+ on Etsy. But I’m fine with selling them for less because I do make some ad money when I share them on the blog. And I just enjoy doing it and don’t want to ship them! They’re still easy to find at thrift stores. Give it a try!